December 11, 2010, witnessed the joint B&H and SCHS/Crew 38 White Christmas event. Held on the Gold Coast, at a magnificent location within a quiet community with a marina a stones-throw away, this was shaping up to be one cracker of a night. Unfortunately for us, it rained all day... So there was no relaxing and catching up in the suns warmth, but I'm sure the humidity made us all feel like we were in the jungle! A rather small event, with it being so close to Christmas, there was at least 40 people in attendance, with appearances from a handful of dedicated inter-staters who showed up to give their support, which was great. As usual, it was great to catch up with old friends from all over Australia, but it was also good to meet new folks. 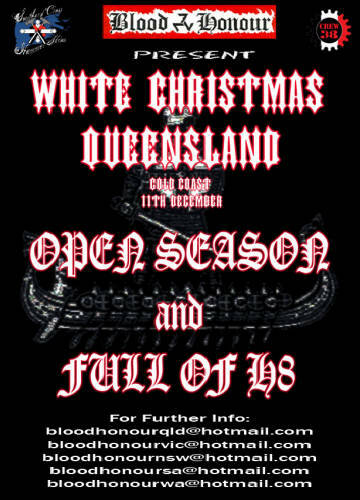 We had two phenomenel bands playing, which were the infamous 'Open Season' and the hard rock stylings of 'Full of H8'. As usual, the gig went off without a hitch and everything got into full swing. First up was the fresh-faced 'Full of H8' who did such classics as the 'Smack 'Em' song from Romper Stomper, a song we all know from the infamous movie, and to be honest, who doesn't think that that has to be one of the best songs off the sound-track for Romper Stomper?! It's an all time classic, and EVERYONE knows the lyrics, so everyone joined in with this charming little song. The band also played Lebo's Out and various covers such as 'Sturmfuhrer' by Landser, and 'To Help My Race Stay Free' by Avalon (one of my personal favourites). Needless to say, the crowd lapped up the performance and shouted for more. Next up was the illustrious 'Open Season', who blasted out such classics as 'Southern Comfort' and 'It's Time', such infamous songs from back in the 80's which would have most Lefties shaking in their shoes! The lads even threw in a few of their newer songs such as 'Kommando' and 'Blood On The Streets', an absolute belter of a set, the guys have really got their skills down pat, awesome guitar and bass playing and some wonderful drum work from the lads. As usual, Open Season never disappoint and got the crowd reering for more and rumour has it, they're releasing a new album in the new future with some of the brilliant songs they played on the night, keep an eye out on 9%! However, that's all we had to offer for this gig, so unfortunately, we had to wrap up there and get stuck into the cleaning up, which, from all the helpers, took no time at all. With smiles all round and many good memories to be had, this was another success for B&H and the SCHS, with many more to come in the near future! I'd like to thank the B&H organisers for setting up a fantastic night, their hard work does not go unnoticed! I would also like to thank the Southern Cross Hammerskins, their Prospects and Crew 38 for managing the doors, merchandise tables, and other various jobs that had to be under-taken, your efforts also contribute for making this a great night had by all! For Faith, Folk and Family.